I have been making this family favorite Chicken Cordon Bleu casserole for over 10 years and my family can’t get enough of it. It’s a fast and easy way to get that Chicken Cordon Bleu taste without all the work. Everyone I have ever shared this recipe with has loved it and added it to their dinner rotation. I hope you and your family enjoy it as much as we do. It’s easy to make this casserole gluten free by using gluten free cream soup and substituting gluten free panko for saltine crackers. I always check deli meat to make sure it is gluten free also. Most of the recipes I make these days are gluten free and most of the time nobody knows. Until I start eating it, that is. First coat a 9 x 13 inch baking dish with cooking spray. Spread 2 cups cooked rice in the bottom of the baking dish. Arrange 3 cups of cooked chicken pieces over top of rice. 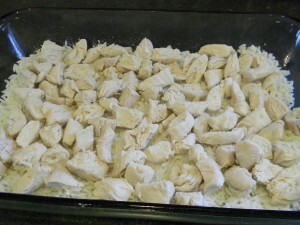 Cook chicken breasts and cut up into bit size pieces or purchase already cut chicken at the deli to save on time. 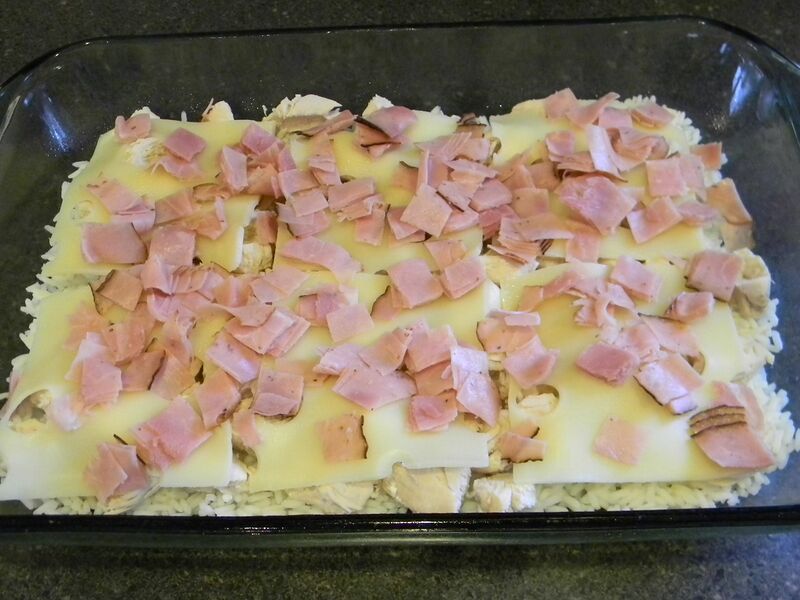 Layer 6 slices of Swiss cheese on top of chicken. 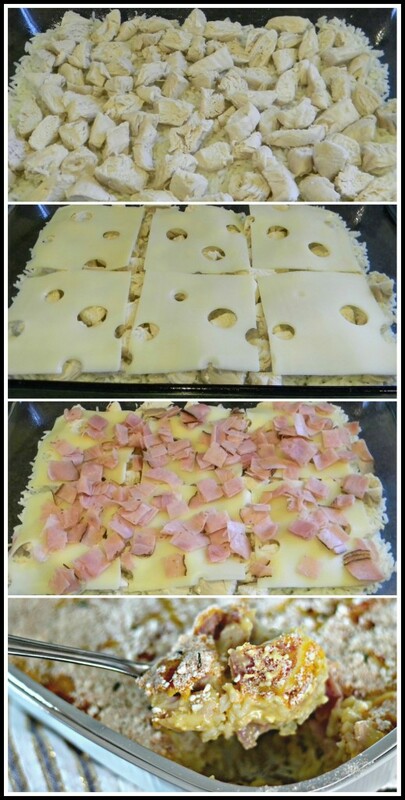 Then layer 10 slices of cut-up ham on top of the Swiss cheese. 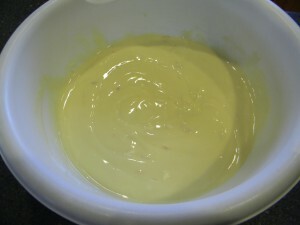 Whisk together 2 cans cream of chicken soup, 1/2 cup milk, and 1/2 cup sour cream. You can make your own cream of chicken soup or I purchase gluten free cream of chicken soup for my family. Spread the mixture on top of the ham. 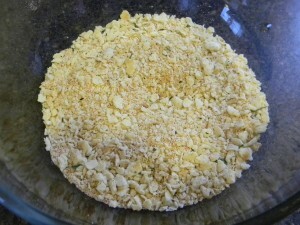 Crush 10 saltine crackers (about 1/2 cup) or use gluten free panko, then add 1/2 teaspoon paprika, 1/4 teaspoon garlic salt, and 1/2 teaspoon parsley and mix together. Sprinkle on top of soup mixture. Bake at 350 degrees for 30 minutes. Now enjoy the best Chicken Cordon Bleu Casserole ever! I’ve been asked if it freezes well. I haven’t tried it yet but as soon as I do I’ll let you know. 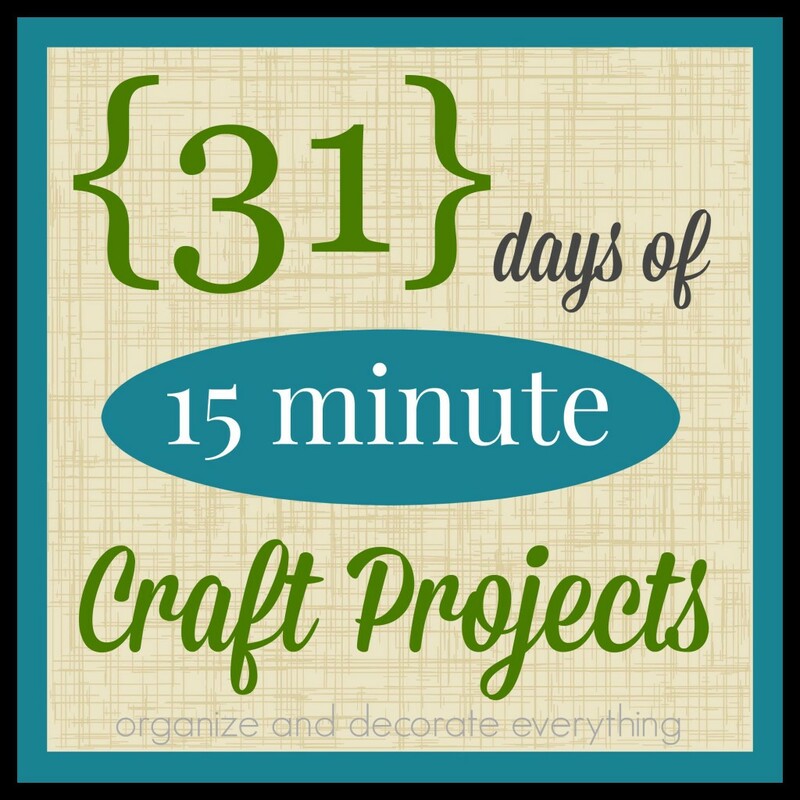 Wow, what a fun idea, I’m going to have to try this! I just opened this up last night and left it open so I can print it out (that way I won’t forget that I want to make it) and showed my husband each layer. He was saying “Oh yeah!” like the kool-aid man through the pictures. I think this one will be a big hit at our house like your pizza spaghetti. YUMMO!!! I cannot wait to try this one. Although, I don’t really like rice. Could I just not add it, would that alter the taste do you think?? Oh my! This looks really yummy! I’m thinking this will be on the menu for us this week! This sounds absolutely delicious! 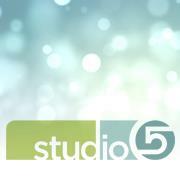 I will share this on FB with our readers! Oh Yummy!!! This looks sooo good but i have one question… Can you use instant rice or is the regular type.. Thanks for sharing !! This is JUST the sort of recipe I was craving and didn’t know lol. I’m leaving this page up and making it TOMORROW. 😀 Thank you! Ok! We just had this for dinner tonight. Thank you! Our whole family enjoyed it. What a fun idea. Just happened to trip upon your blog and fell in love with this recipe. 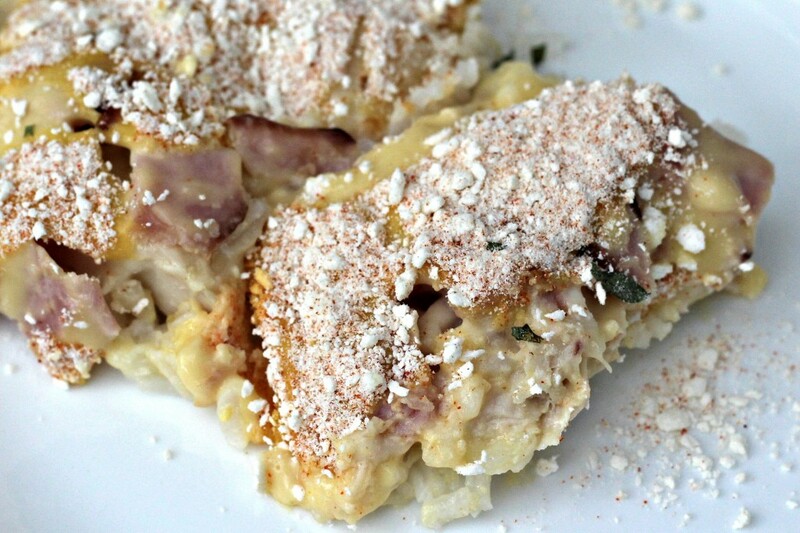 I have tryed to make Chicken Cordon Bleu a million ways! This one looks like a “no-fail” for me! Yay! You just solved the dinner dilemma for tonight, this looks yummy! Okay…this was really good. I made some slight modifications (ie. brown rice, greek yogurt, fat free soup, etc.) Definitely going in the rotation. Thanks so much! I made this for dinner tonight and everyone (all six of us!) loved it!! Thank you for the easy and delicious recipe! Very good! I even cut recipe in 1/2 and used 1 can soup, 1/4 sour cream and 1/4 milk. Also used 1 large can of canned chicken to make it quickly and it was fine! Also used sliced provolone instead of Swiss. Was great! Making this for dinner tonight! Thank you! Just made this for dinner tonight! Used a ham steak because that’s all I had. Everything else followed the recipe to a t! This was amazing!!!! I made this tonight and used pasta instead of rice and I tossed the chicken with 2tbsp Dijon mustard. It is in the oven now! Smells awesome! Making it now! Cannot wait to try it! I am thinking no rice and corn flake crumbs instead! This is in the oven right now! Only, because my husband doesn’t care for rice, I substituted hash browns! Hopefully, both being starch, it will work out! I’d like to make this gluten free, but I’m wondering how much it would effect the taste of the dish if I omitted the crackers at the end? Could some dry bread crumbs (gluten free) be substituted for them possibly? I am so glad that you posted this recipe! I made the exact same thing a long time ago and then I lost the recipe! I’ve been looking for it ever since so THANKS!!! I made this for dinner tonight and it was awesome! Thank you for sharing. I love you! 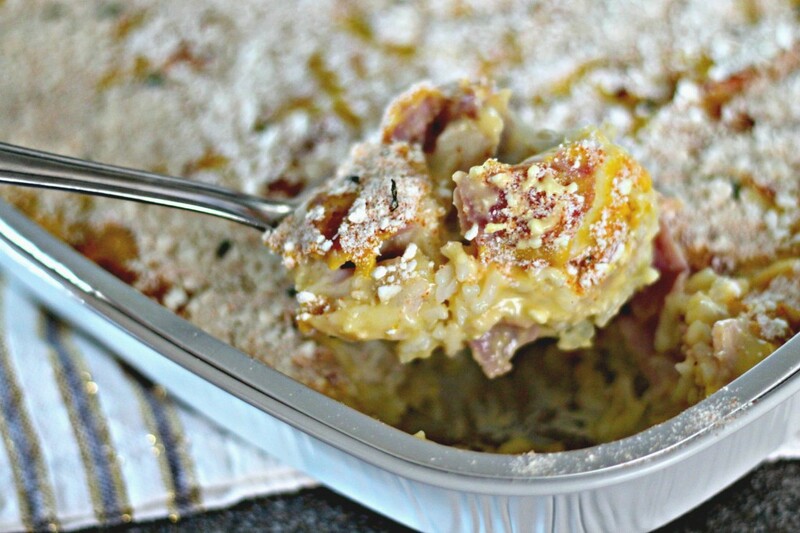 Seriously, turning my favorite food into a casserole, pure genius!! It’s going on the menu this week! Seriously? One of my all time favorite things to eat! I am so excited to try this!!! Could this be made ahead of time and stored in the freezer? How many people does this recipe feed? I am making it this weekend for 6-7 people. I have made this twice now and it was a HUGE hit both times! 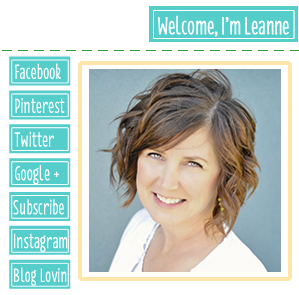 I did however make a couple tweaks – due to items on hand. I substituted turkey for chicken and leftover mashed potatoes for the rice. My family LOVED it!! Thank you for sharing your recipe! My daughter made this and raved about it. Convinced me I just HAD to make it, so it’s now on my meal plan for the upcoming week. Can’t wait! I made this on Monday night and it was a huge hit! I did sprinkle some paprika, salt, and pepper on the chicken before cooking and then added extra to the crackers. This was awesome!!!! I made this tonight and it was amazing!! I used club crackers instead of saltines and it was perefect!! Thank you for this recipe. I just made this for dinner. Thank you for sharing a great recipe. So much easier than traditional CCB. You have fans in North Pole, Alaska. If you want to make this awesome recipe without having to use the disgusting canned cream of chicken soup, here is a really easy recipe for DIY CoC soup. It is not my recipe, but I have tried it and it is fantastic!! I can’t eat rice so I will substitute the rice with potatoes. Sounds yummy. I pinned the recipe to Pinterest. I tried this tonight but halved it and it was wonderful. My 3 year old loved crunching up the crackers. Thanks for the inspiration! I made this tonight after searching for a new chicken recipe and I’m pleased to share that this will be made on a regular basis now! One out of my three kids ate and liked it (that’s almost a record with my picky eaters) and my husband and I couldn’t get enough! I was trying to find something new for our church luncheon next week. I think we have a winner. I’ll most likely trade the rice for egg noodles (my kids don’t like rice). Can’t wait for the reactions- my hubby loves CCB but I’m lazy in the kitchen and never make it…hopefully this will do the trick! Thanks!! Made this for dinner tonight, subbing provolone and panko bread crumbs (because that’s what I had on hand) and it was fantastic! It got rave reviews from the hubby (not an easy feat when trying a new recipe). He went back for seconds and already packed some for lunch tomorrow. Definitely a keeper! Thanks for the recipe! Is that boiled chicken breast? Found this recipe a few days ago, making it right now for my Bible study group..Hoping it turns out okay! However, I’m bummed I just noticed someone’s comment where they tossed their chicken in dijon mustard…I have the mustard they use at Firehouse (it has a little bit of horseradish in it, it’s so good!) and I wish I would’ve thought about using that! *the only change I made was I used canned chicken instead of chicken breast. I AM MAKING THIS AS WE SPEAK. I CANT WAIT TO SEE WHAT MY PICKER EATERS WILL SAY! THEY THEY LOVE ALL THE INGREDIENTS SO WE WILL SEE.. THANK YOU FOR THE POST! This looks awesome! I love Chicken Cordon Bleu so I’m sure I’ll enjoy this as well. Can’t wait to try it. 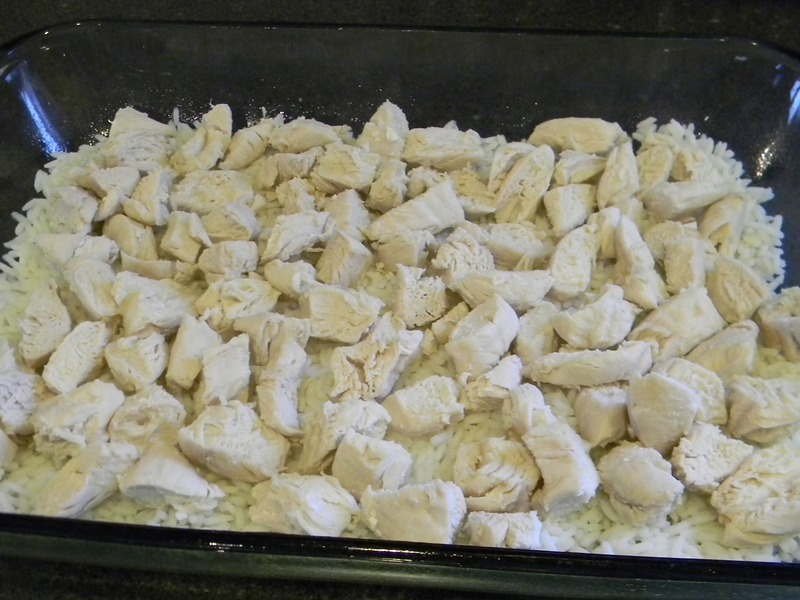 is there a way to use uncooked rice, and uncooked chicken and it turn out the same? OMG…this is fabulous!!! Tastes wonderful!!! Made this for my “men” (hubby and 4 grown sons) last evening. It was a huge hit! Hubby is not a rice eater, so I substituted wide egg noodles for the rice. I also served extra noodles in the cream of chix soup on the side. Oh, and I sprinkled a little bit of taco blend cheese throughout as well. This is definitely a keeper recipe. Thanks so much for sharing it! I have made one similar and instead of the bread crumb mixture, we use salad croutons ie garlic and cheese and it is a favorite to all who try it. Awesome recipe! Its on the grill, cookin at camp! Sounds great, I can’t wait to try this!!! Made this tonight an it was delish comfort food! Adapted the recipe to gluten free with GF soup and GF pretzels instead of the crackers. I am making this tonight. I always use cream of mushroom soup in things, so when I sent hubby to the store it was automatic that I wrote two of those, so I went ahead and used that and it is in the oven now. Smells good! I just finished eating this! What a great dinner! My kids even enj0yed it. It has made it t0 the dinner rotation!!! I have made this. I love it. The family loved it. It is a 5 STAR recipe. I even made a quiche, inspired by this casserole. For the next time, however, for my ham loving family, I will mix in diced ham (uncured, natural) into the different layers. I used an already cooked roasted chicken from the grocery store. I also diubled the topping with the crackers, garlic salt and paprika. It was fantastic!! 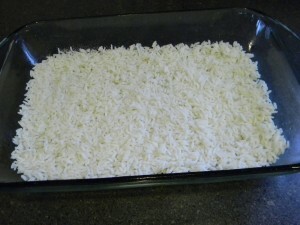 I have a question …..is the rice precooked? Modifications: 1. used a mixture of brown/wild rice 2. after frying chicken pieces deglazed pan with dry white wine(about a 1/4 c) and reduced it to half, then adding it to the soup mixture 3. topped it with sundried tomatoe dried baguette crisps (chopped up) Followed rest of recipe as outlined. Dee-lish!!! It’s a keeper! 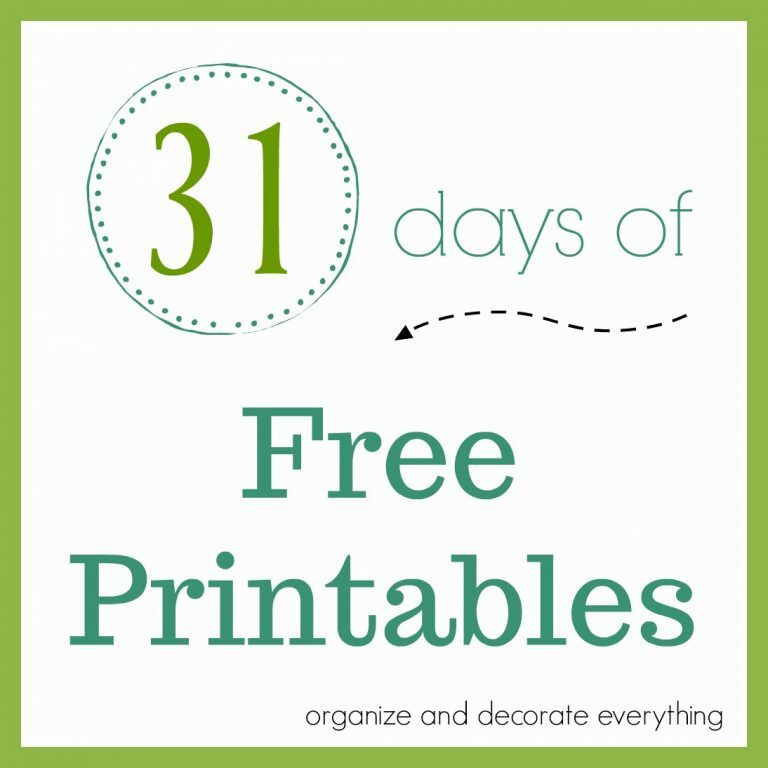 I made this last night and it was very easy and the kids loved it! Made this for dinner tonight, it was easy and every one loved it…. No leftovers..
Just ate this for dinner, I got five thumbs up. It’s delicious!! Add 1/2 tablespoon of spicy mustard to the sauce. It takes this dish over the top! Found this on pinterest, and we loved it. Just ate this for dinner! Husband loved it and he says he doesn’t like chicken!! Will make this for the grandkids next week! Yummy!! Wow! I found this great recipe via Pinterest. 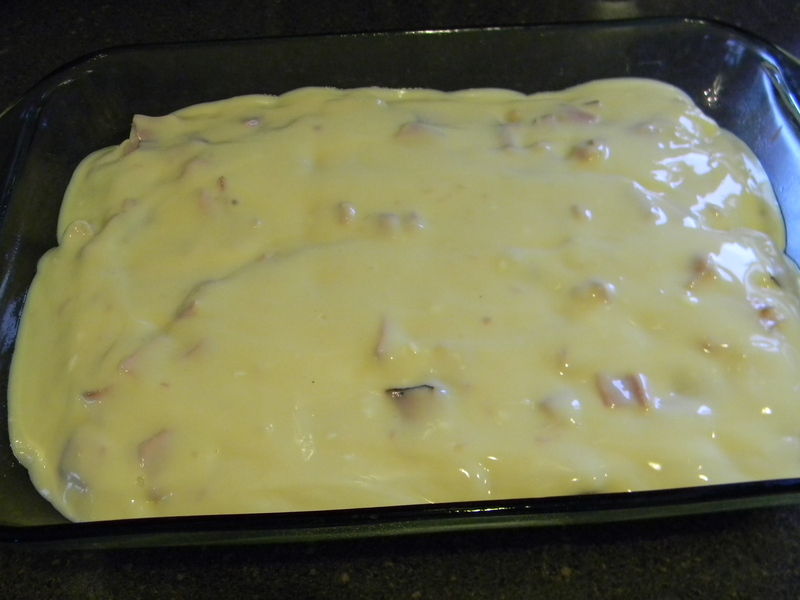 I made a couple of very simple modifications: added about 3/4 cup more rice, diced up a store-bought small ham steak (from the lunch meat/sausage section) instead of using sliced ham, and used Ritz instead of saltines. DEFINITELY a keeper! MANY thanks for sharing! I made this tonight with a few modifications as suggested above and one of my own. It was a BIG hit with even with a picky 7 year old and a 17 year old “selective vegetarian’. I made it as suggested except added 1/2 bag of frozen broccoli cuts (thawed) on top of the ham and under the sauce. I also added the 1/2 tbsp of spicy mustard to the sauce as suggested by Michele above. Finally, I topped it with a package of Stove Top dressing made according to the package directions instead of the crackers. YUM!! My family LOVES chicken cordon bleu, but to feed all of us it can get quiet spendy! 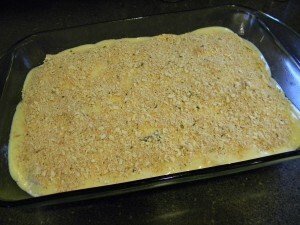 I have this casserole in the oven RIGHT NOW! 🙂 Cant wait to taste it, it already smells yummO! Thanks for sharing your recipe! This really was Superrrr!!! WoW! Everybody LOVES it! This was much easier and less time consuming then the traditional cordon bleu rolled up! I used Ritz instead of saltines., Just awesome. Thanks for sharing!!! This is definitely one that we will rotate into our regular family meals!! Thanks!!!! This has become one of our favorites. Thanks for posting it. YUMMY! Super easy to adapt to whatever you have on hand – I used pepper jack cheese, a 6oz pkg of Canadian bacon (probably wouldn’t have needed the whole package) and cream of celery soup. While that may not be “true” CCB, it worked out great! Just made this for dinner tonight. Absolutly amazing!!! I added a little Dijon mustard to the sauce. My daughter made this for her family and gave me the leftovers. Absolutely yummy! Sounds yummy… can it be frozen before baking and how would that affect cook time? We used cubed leftover ham and substituted fat free chicken gravy as we didn’t ‘t have two soups on hand Found this to to be real tasty nd less calories. Also omitted the sour cream and added a small amount of water to loosen up the soup and gravy. Enjoyed! This was delicious. I actually used greek yogurt for the sour cream and used unsweetened vanilla almond milk instead of regular milk. My whole family (even my extremely picky 3 year old) loved it! This sounds fabulous! I usually go thru the whole wrapping it into rollups and its so time consuming. Definitely doing it like this next time. I’m assuming I can do this in the crockpot as well? Starting with raw chicken and uncooked rice. LOVE this! Thank you so much for the recipe. It was a huge hit with my family! I would love to have this recipe in a format that I can print and add to my recipe book. Does anyone have it? Is this a gluten free recipe if I don’t use the crackers on top? I love this meal. So does the hubs & my 5 & 2 year old. I use yellow rice instead of white due to my husbands taste. It’s in the oven as we speak. This recipe has made it into the rotation. Yummy!!!! Sounds amazing! Definitely trying this one for my family of chicken cordon blue lovers 🙂 Thanks for the recipe! It would be gluten free if you use a gluten free cream soup and make sure the ham is gluten free. 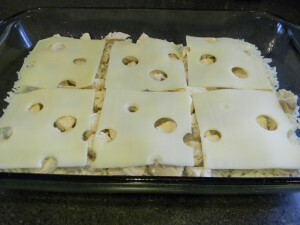 You can also use gluten free crackers or a crunchy substitute for the crackers. I don’t really know anything about the plate. I found it in a thrift store and loved it. They only had 2 so I bought them both. Thank you so much for this one! I make this at least twice a month. 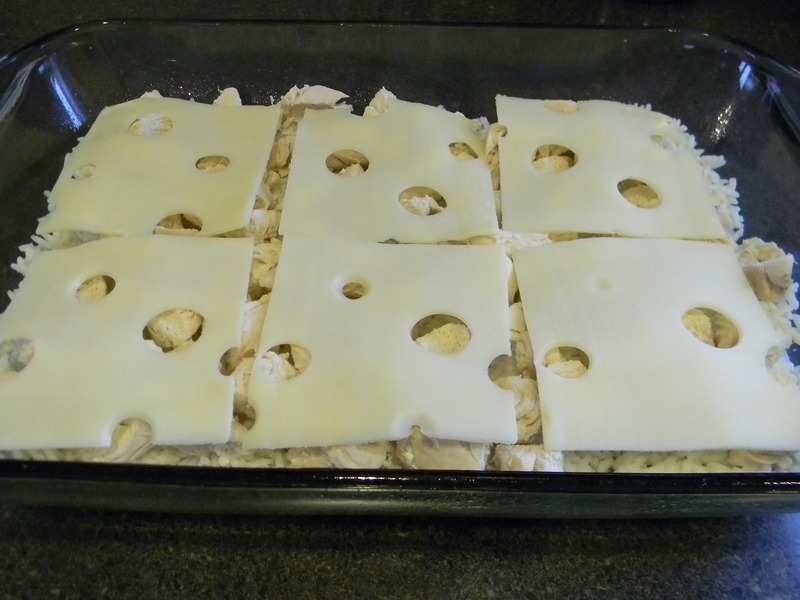 My husband and I really love the taste of all the flavors in this dish, I use Ritz crackers instead of the saltines. This is absolutely awesome!!!! Thanks for the recipe!!!! Trying this tonight, but using a honey-mustard glaze when baking the chicken, Uncle Ben’s wild rice and topping the casserole with Stove Top stuffing and panko mixture (no white rice or crackers here, but this just sounds too good!). We’ll see! Is the 2 cups of rice measured before cooking or after? Made tis for my family tonight. They ABSOLUTELY Loved it!!!! VERY VERY GOOD!!! This has become a favorite that I make again and again. My husband is the cook in the family, but he loves when I make this too! I made this for our family and NOTHING was left! Serving it again tonight! I thought it sounded good so I tried it. Instead I put stuffing on the bottom rather then rice and Panko breadcrumbs with the spices added. It was delicious . This is definetely a keeper. I make this for my family and they love it! 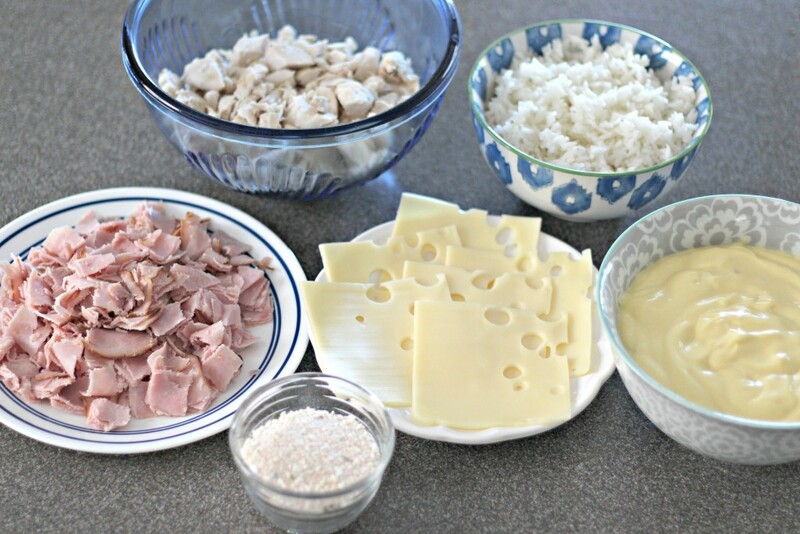 I use the same ingredients as you with the exception that I use shredded Swiss cheese and I mix everything up rather than layering everything and I use crushed Ritz crackers mixed in melted butter on top. I made this last night, and it was a huge hit with my family of four. I used rotisserie chicken. We had barely any leftovers. This would be a wonderful dish to make around the holidays or for a potluck. Definitely adding into the rotation! 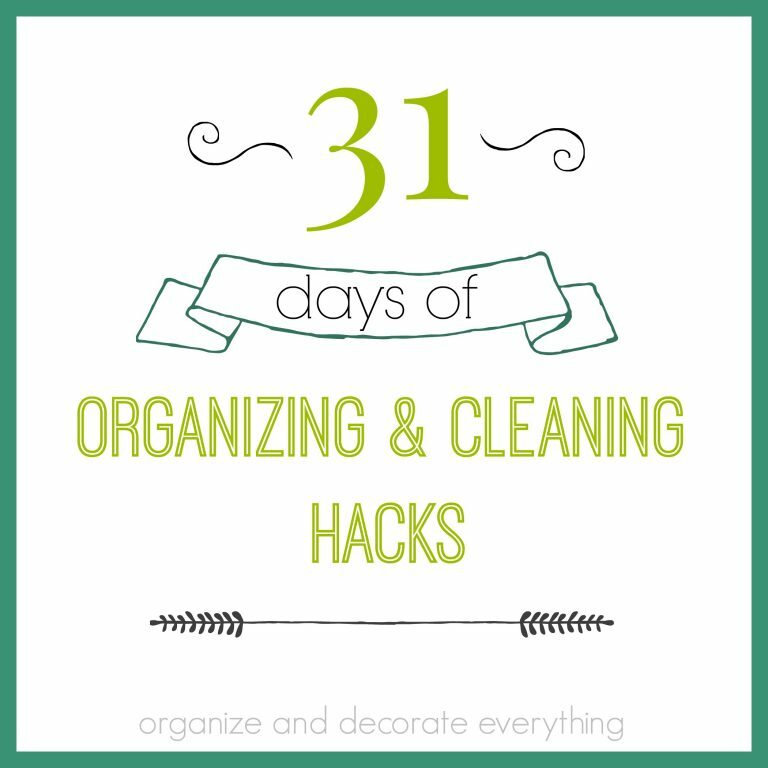 Finally making this after it has been pinned for about 2 years. In the oven now – can’t wait to try it. Made this low carb today by subbing cauliflower for the rice & French fried onions for the crackers. It was a hit! Yum!!!!! I made this tonight with our leftover Christmas ham. I did sub the rice with egg noodles, just because of time constraints. It was easy and delicious. My family scarfed it down fast! Made this because my friends had been raving about it. I didn’t have any parsley, and I made 1 can of the soup from scratch out of the 2 (hey, use what you have on hand). It was great! My husband really liked it, and best of all, my picky 4yo daughter ate all of her plate! This one will get added to the rotation! I have made this a few times. It is a hit in my house. And I normally HATE cream of chicken soup or things cooked with it. My kids actually asked me to make it tonight. This has become such a favorite in my home, THANKS so much for sharing it with all of us.